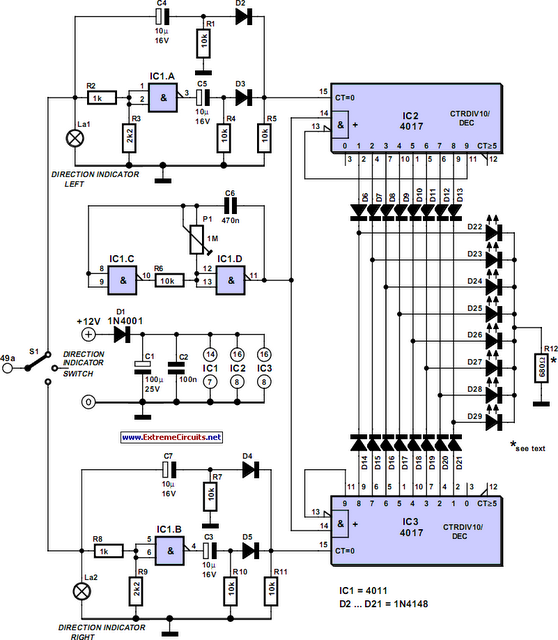 This circuit represents a somewhat unusual blinker indicator for use in a car or model. The running-light display progresses toward the left or the right depending on which directional signal is activated. That’s pretty cool if you’re fond of light-show effects. The circuit consists of two counters (IC2 and IC3), which are reset to zero via C4 or C7 respectively whenever a blinker lamp (La) illuminates. The running-light display thus runs through once and then stops, since the highest counter output is connected to the Enable input. When the lamp goes out, a new reset pulse is issued to the relevant counter by NAND gate IC1.A or IC1.B respectively, and the counter counts all the way up again. The progression rate of the display can be adjusted to the right speed using P1. Only one LED is on at a time (except for the hazard blinker). This allows the brightness to be easily adjusted using R12. Incidentally, the circuit can also be modified by replacing the normal diodes with LEDs, with all of the cathodes connected to ground via R12.